Listen to Suzette Grillot's conversation with University of Oklahoma German literature professor Bob Lemon and Oregon State University German culture scholar Sebastian Heiduschke. In 1949, postwar Germany officially split into two separate countries with the formation of the German Democratic Republic. Also known as East Germany, the GDR was isolated from the Western world for nearly three decades, but it developed its own, equally rich literary and cinematic cultures. East Germany did begin producing motion pictures before it officially broke away from West Germany. The films initially were rooted in similar cinematic traditions, says Oregon State University German language professor and world culture scholar Sebastian Heiduschke. He says when the Berlin Wall went up, the similarities between East and West German filmmaking began to disappear. “[The construction of the Wall is] really the most defining moment [for East German filmmaking] … [and] that’s when the East German cinema becomes a cinema in its own right,” Heidushcke said. East German film became much more political and was used to further the agenda of the state. So was East German literature, and both art forms took on characteristics of socialist realism, an artistic tradition where art is used to depict communist ideals. “Often in literature, [socialist realism is] sort of dismissed as ‘boy-meets-tractor,’” says Bob Lemon, an associate professor of 19th and 20th century German literature at the University of Oklahoma. Lemon says East German literature provides a glimpse into the culture the country and the divisions between East and West. “Even 25 years later, you see that divide between two peoples who’ve had very, very different histories and brought up in very different systems and different traditions,” Lemon said. Although the cultural differences between East and West are apparent in the literature from the time, so too are the similarities. Lemon points to The New Sufferings of Young W by Ulrich Plenzdorf as an example. KGOU and World Views rely on voluntary contributions from readers and listeners to further its mission of public service with internationally focused reporting for Oklahoma and beyond. To contribute to our efforts, make your donation online, or contact our Membership department. I think the interesting part about East German cinema is that it starts in 1946, before the country East Germany actually launches; so the country was founded in 1949, but East German cinema starts in 1946. So there were films made for that cinema before we actually had the nation-state in place. And it ends in, more or less, 1994 – so four years after Unification. So I guess that's the most interesting part about it – that it starts before and ends right after that. And it's not necessarily what we would think of a communist or a socialist country. Especially in the beginning, the films were pretty much what we would expect from West German movies – so very entertaining musical comedies, melodramas, and so on. And that kind of drifts away in the late 1950s and then especially in the 1960s once the Wall goes up. So that really the most defining moment. Once the interaction between West German filmmakers and East German filmmakers stops, that's when the East German cinema becomes a cinema in its own right and that's when it becomes more political. So that's when it supports the agenda of the nation. 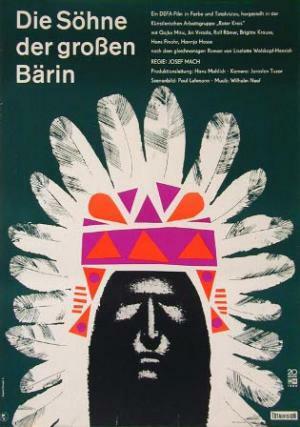 I think it's usually surprising to hear that the genre film in East Germany had things like westerns, science fiction films, love stories, pretty much anything you can think of… The Indianerfilme, the westerns [were] a series of 12 – and some say 14 – westerns that look at the life of the Native Americans kind of from a reverse angle – so out of the perspective of the Native Americans, the struggles of the Native Americans. Or science fiction films that bring out the accomplishments of international solidarity – so a space crew that consists of many races and, of course, all of the genders. And so we have of that in these films and I think that's a lot of time very surprising. I think more important is for students to understand that films are never a depiction of reality. So we can extract information from these films and we always have to make sure that we put on our critical lens. I think what is important for me is that students do not just passively watch these films, but they begin to ask the questions afterwards and to criticize – to say, "I don't think reality was the way we see in these films." And that's when I think that my work is more or less done: once they start asking the questions and begin to question also the medium of film. That's when I think we are where we need to be… I think that's ideal that they actually start criticizing and thinking critically about the images that they're seeing on the screen and whether this is perhaps a sanitized version of reality or whether it actually does show that, even under that system, humanity could in some ways flourish and be reborn. SUZETTE GRILLOT, HOST: Bob Lemon and Sebastian Heiduschke, welcome to World Views. BOB LEMON: Thank you very much. GRILLOT: Well the both of you have a background in the Germanic parts of the world and, Sebastian, for you particularly, East German cinema and, Bob, for you, literature. But let's start first with you, Sebastian, and talk about East German cinema because – well, first of all, let's remind ourselves that East Germany used to be a separate country even though East Germany and West Germany came back together almost 25 years ago – they still are known for the cinema, the film, that they produced during their time as the GDR. So can you tell us a little bit about some of those defining characteristics of East German cinema and how it might be distinguished from other German cinema, other German films? HEIDUSCHKE: So I think the interesting part about East German cinema is that it starts in 1946, before the country East Germany actually launches; so the country was founded in 1949, but East German cinema starts in 1946. So there were films made for that cinema before we actually had the nation-state in place. And it ends in, more or less, 1994 – so four years after Unification. So I guess that's the most interesting part about it – that it starts before and ends right after that. And it's not necessarily what we would think of a communist or a socialist country. Especially in the beginning, the films were pretty much what we would expect from West German movies – so very entertaining musical comedies, melodramas, and so on. And that kind of drifts away in the late 1950s and then especially in the 1960s once the Wall goes up. So that really the most defining moment. Once the interaction between West German filmmakers and East German filmmakers stops, that's when the East German cinema becomes a cinema in its own right and that's when it becomes more political. So that's when it supports the agenda of the nation. GRILLOT: So do you find the same phenomenon, do you think, Bob, in literature? That you have this kind of distinction between very entertaining literature that then becomes quite political after that political divide is memorialized in the wall? LEMON: Well you have an official kind of credo, an official kind of system of how you're supposed to depict the GDR. And that's called socialist realism. And often in literature, it's sort of dismissed as "boy-meets-tractor," which is the idea that you're supposed to show how the socialist system is growing and how society should progress into the future. But of course, over time, writers work within that system, they negotiate that system, and they develop their own interests. So you have major figures coming out of East Germany like Christa Wolf, who was obviously celebrated as much in the West – perhaps even more so than in the East. And you have, also, dissident voices that continue to be contrary even after the wall has come down. So I've been working on a poet called Volker Braun who, as a sort of true believer in socialism, was convinced that when the Monday Demonstrations started in Leipzig, that that would lead to a proper people's revolution, and was bitterly disappointed when the West – in his view – sort of colonized the East and just came in and took over. And so I've been looking at poems that he wrote actually at the time the Wall came down. And he's moving from euphoria to disillusionment in the space of really just a year or so. And so he could see where this was going at the time. And if you look at East German literature, I think it still has remnants – even now, even 25 years later – you see that divide, culturally, between two peoples who've had very, very different histories and brought up in very different systems and different traditions. GRILLOT: So what are some examples? You mentioned a poet for example. But what are some additional examples of authors and film that we could even refer to in terms of that real, cultural difference in East Germany? LEMON: Well there's a text that I teach, which is from the 1970s, called The New Sufferings of Young W, and it's actually sort of an extended riff on a very old classic work of German literature by Johann Wolfgang von Goethe. And in the original, we have a young man who falls in love with a woman who's engaged and he ends up committing suicide out of love for this young lady. And in the updated East German version from the 1970s by Ulrich Plenzdorf, our hero is an equally alienated young man who goes to live in this small holiday home just outside of Berlin – he's sort of squatting there. And he ends up sort of expressing the alienation of his generation in sort of very groovy 70s language. So that was a kind of work where you could see that all the problems that we associate with youth in the West – alienation, a feeling of conflict with the older generation – were absolutely being experienced on the other side of the Iron Curtain. And it was one of those works that came out in the period of liberalization in the early 70s that meant that those in the West could suddenly identify with those in the East and they could all share their obsession with music and jeans or whatever. And there's a sort of sense in which, for just a brief moment in that period, the two countries had similar interests, at least amongst the youth. So a work like that would be a very useful way of sort of getting into East German culture in a way that isn't so alien to a Western audience. HEIDUSCHKE: I think there are a bunch of films that come to my mind. But what I like to distinguish are the films that were made for political purposes, for agitation and propaganda purposes by the party, and then film that were made for entertainment purposes. I think it's usually surprising to hear that the genre film in East Germany had things like westerns, science fiction films, love stories, pretty much anything you can think of. Also very critical films – films that were so critical of the government that the government – they allowed a certain point of criticism – then had to intervene up to the point that they had to ban films. So in 1965, they had to ban the entire production of that year because it was too liberal; it was like the French new wave cinema that criticized East Germany and the state of East German cinema at that point. But film that comes to my mind, if we were to talk about political films, I would probably use Kurt Maetzig’s Ernst Thälmann film. It's a two-part film, a biopic about the leader of a work movement in the Weimar Republic, showing Germany of the 1920s. That's on the political side. And then for other films, like I said, what was called the Indianerfilme, the westerns. It's a series of 12 – and some say 14 – westerns that look at the life of the Native Americans kind of from a reverse angle – so out of the perspective of the Native Americans, the struggles of the Native Americans. Or science fiction films that bring out the accomplishments of international solidarity – so a space crew that consists of many races and, of course, all of the genders. And so we have of that in these films and I think that's a lot of time very surprising. GRILLOT: Well, Sebastian, you also run a program called The Darkside Cinema, which provides access to free film for students. Tell us a little bit about this and the importance, it seems to me, that you were expressing about students watching film. HEIDUSCHKE: The Darkside Cinema is an independent movie theater, privately owned movie theater in Corvallis, Oregon. And what I did is I partnered up with that cinema to give students and also community members the experience of going to the movies and watching movies the way we really want to watch movies. So I take students to the movie theater to get the smells, the sights the sounds, but then also we look at projection equipment – things that we sometimes don't think of when we teach film or when we talk about film. And so they get the hands-on experience. The free film screenings are a service to the students and also to the community. We are a small college town and I think it's important for the university and the community to get along because we coexist in the town. And so having these free screenings is one way to connect with them. The screenings are usually recent releases; a lot of the time we have premier screenings. We have huge film festivals for such a small community. We partner up with major television stations in Germany who bring in their films; we have a co-operation agreement with the Portland German Film Festival. So it's just a way of making sure that students and that community members can experience the joys of cinema. GRILLOT: The joys of cinema, for sure. As a film buff myself, I love to watch film and we do so for many different reasons. But I think one of the things that we get from film – and it sounds to me like both of you are dealing with this – and as well through literature, is that we learn things. We learn about substantive issues, whether they're political issues. That film and literature are rarely just entertaining; they actually have a message or they have something that they can teach us. So is this also kind of a motivation and how you use film? Both of you are obviously in a university setting, teaching about film. It's not just about filmmaking but what you can express through film. And I think I hear both of you talking about connecting through film and literature and sharing identity through film and literature. Those are really important things that we can do in society. Is this also part of what you do? HEIDUSCHKE: I think you're right. That's one part of it. But I think more important is for students to understand that films are never a depiction of reality. So we can extract information from these films and we always have to make sure that we put on our critical lens. I think what is important for me is that students do not just passively watch these films, but they begin to ask the questions afterwards and to criticize – to say, "I don't think reality was the way we see in these films." And that's when I think that my work is more or less done: once they start asking the questions and begin to question also the medium of film. That's when I think we are where we need to be. GRILLOT: Same for literature, do you think, Bob? LEMON: Absolutely, absolutely. I'm teaching the senior thesis Capstone course at the moment – actually we're dealing with the film The Lives of Others, which is a very famous film that depicts the East German Stasi, the secret police. And my students, as they watched the film and then find out about the historical reality and they start questioning how the film portrays, for example, the Stasi spy who sort of regains his humanity in the process of observing a particular couple, then I think that's ideal that they actually start criticizing and thinking critically about the images that they're seeing on the screen and whether this is perhaps a sanitized version of reality or whether it actually does show that, even under that system, humanity could in some ways flourish and be reborn. GRILLOT: Well I have to ask in the little bit of time we have left about comparing American film with German film and how Germans are depicted in American film and how Germans might perceive that. When you mentioned Christoph Waltz, for example, always playing the bad guy almost. So how can you compare the two and how do we perceive each other through our film? HEIDUSCHKE: And it did that very successfully. But that's all there is to it. GRILLOT: Well the bad guys always have the British accents. LEMON: [Laughs]. That's right! Because they're suave and sophisticated and then that means evil, I think, for an American audience, to an extent. But I do think that the German experience of being typecast will be changed at least since we have German actors coming to appear in Hollywood films as opposed to Anglo-American actors doing German accents. GRILLOT: Well very interesting. Bob and Sebastian, thank you so much for being with us today to share your insight about film. Thank you. LEMON: A pleasure. Thank you. Copyright © 2015 KGOU Radio. No quotes from the materials contained herein may be used in any media without attribution to KGOU Radio. This transcript is provided for personal, noncommercial use only. Any other use requires KGOU's prior permission. In 1989, the Berlin wall was dismantled and by the next year, Germany was once again one country. That meant consolidating East and West Germany, and often the West’s laws and culture prevailed over those of the East. University of Oklahoma International Studies professor Rebecca Cruise is an expert on Eastern Europe.